Odiongan, Romblon Mayor Trina Firmalo-Fabic could not help but promote online her gown locally woven by the women of Sibuyan. In her Facebook account, Firmalo-Fabic showcased her printed native clothing woven by the Asosasyon ng Manghahabi at Magtatagak ng Nahot sa Cajidiocan (AMNAC). The mayor wore the glamorous blue gown during her first State of the Municipality Address infront of the Odiongan Town Hall last month. “Let us support the product of AMNAC. Romblon has several products we should patronize,” she said. The clothing which are handwoven could be bought from the Romblon State University-Cajidiocan campus. 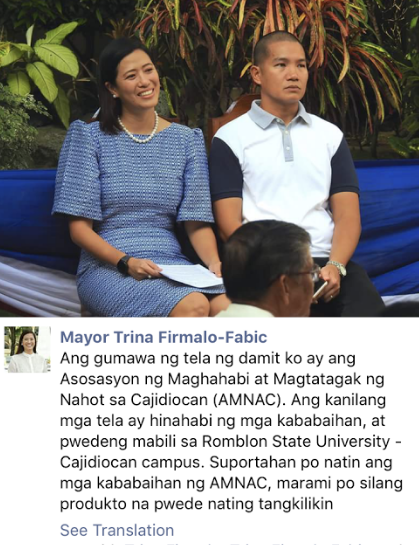 Asosasyon ng Manghahabi at Magtatagak ng Nahot sa CajidiocanFirmalo-FabicMayor Trina Firmalo-FabicOdionganRomblonwomen of Sibuyan.